4 games to 2 to capture the Memorial Cup title. 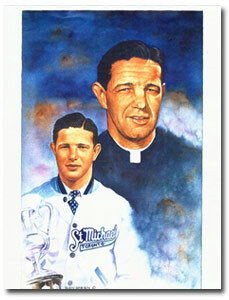 This portrait of Father David Bauer by Glen Green was handed out during the 1989 Hockey Hall of Fame Induction weekend. 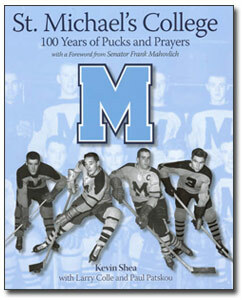 Cover of "St. Michael's College, 100 Years of Pucks and Prayers" (© 2008 St. Michael's College, Kevin Shea, Larry Colle, Paul Patskou and Fenn Publishing Company Ltd.) Father Bauer joined the teaching staff at St. Michael's College in 1953. Early 1970's report typewritten by Father David Bauer and submitted to Doug Fisher Chairman of the Executive Committee for Hockey Canada. 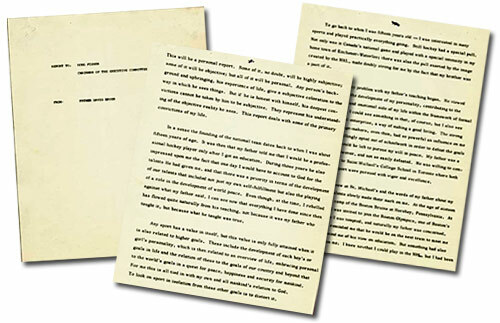 The report provides some history and insight into Father Bauer's convictions  personal development through sport and his vision of amateur hockey in Canada. 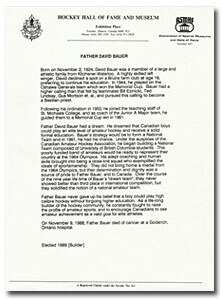 Biography of Father David Bauer who was inducted into the Hockey Hall of Fame posthumously in 1989 in the Builder Category. 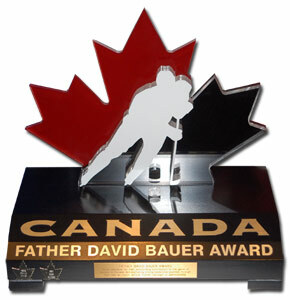 Father David Bauer Award presented to an individual for their outstanding contribution to the game of hockey in Canada demonstrating strong leadership qualities through their role as a coach, official, trainer, manager or administrator.